Barely a month to the start of the 2018/19 Startimes Uganda Premier League, Bright Stars have landed a sponsorship deal for the upcoming season. The club has on Monday morning signed a $40,000 deal with Yoshino Trading Company Limited. The duration of the sponsorship package is for one year and also comes with a new team bus. 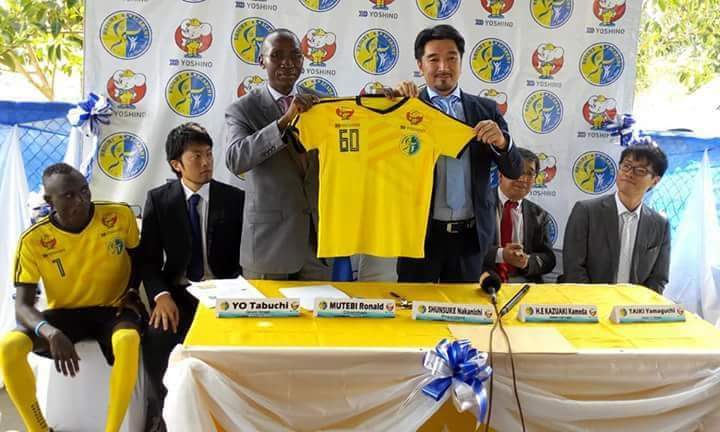 While announcing the deal at Champions stadium in Mwererwe on Monday, Shunsuke Nakanishi the President Yoshino Trading Company indicated that they are pleased to partner with Bright Stars FC. “We are pleased to announce our partnership with Bright Stars FC, said Nakamishi. “We believe our partnership will help the two parties achieve their respective targets. Ronald Mutebi, Bright Stars FC chairman thanked the new sponsors for choosing their club. ”I thank our new sponsors Yoshino for choosing BrightStars FC. “We believe the partnership will take us a long way in improve as a team. ““Many people want to go for already established brands but they chose to develop with us, something we have to be proud of. “I want to promise that as a club, we shall fulfill the agreed principles within the contract. Yoshino Trading Company is a major importer of cars in Uganda and have been in the business for the last six years. Bright Stars FC have in the past had Lato Milk, Ferro Mobile, Kings Bet and SMS One as sponsors.